We first read about OptiMind on a Reddit nootropics forum, where users were discussing the product’s frequent formula change. Curious to see what all the hype was all about, we hopped our way to Google to do a thorough search on the product as well as to visit OptiMind’s official site. OptiMind is an energy-enhancing nootropic supplement which claims to increase mental energy, enhance memory and boost productivity. OptiMind’s team believes that providing the brain with essential nutrients and amino acids will recharge it and allow it to gain the power it needs for optimal concentration and alertness. With such ambitious promises, we were eager to see if OptiMind was going to prove a tough match against the so far unbeaten . The company’s decision to change the product’s formula several times understandably sparks some kind of skepticism. We hope that OptiMind is a company that cares for each customer’s needs and does not abide by a hidden agenda such as formulation cost cutting. They seem pretty active in the nootropics space and so we get the impression the team are simply trying to better their current product. OptiMind does reveal a full supplement facts label on their website. L-Tyrosine, Taurine, Phosphatidylserine (Serinaid), Bacopa Extract (50% Bacosides), GABA (Gamma-aminobutyric Acid), Caffeine, Alpha-Lipoic Acid, Vinpocetine, Sulbutiamine, Huperzine A (from Huperzia Serrata Extract). Sadly, it would seem we are faced with the same old story. Yet another product featuring the same handful of ingredients – Bacopa, B12, Phosphatidylserine, Vinpocetine, and Huperzine A. These usual suspects seem to appear in a good 70% of all nootropic formulas. We can’t help but feel that, where someone once pioneered, everyone else is now just copying. Optimind follow suit. Looking for positives, it was, and always is, nice to see Sulbutiamine, abd OptiMind have included it. Sulbutiamine is a pretty famous nootropic having been shown to enhance memory, focus and problem solving abilities in lab rats. Once taken orally, sulbutiamine gets absorbed through the intestines and then enters your blood system to make its way up to the brain. It then crosses the blood-brain barrier and gets broken down into Vitamin B1. Sulbutiamine also increases the release of dopamine, which is a neurotransmitter responsible for pleasure feelings. For this reason, Sulbutiamine may be able to help improve mood as well. Huperzine A, like a poor man’s Noopept, works mostly to improve working memory and learning capabilities. Some research would suggest that it has antioxidant properties, meaning it can help protect the brain against harmful radicals. Huperzine A should be cycled with a 30-day rest period after every 90 days of use being a common cycle pattern followed. We tested OptiMind for a period of 8 weeks. Those participating were very glad with the results for the first week or so. Reports of bursts of energy were common and our panelists noted feeling motivated to work during the initial honeymoon period. The good news quickly became old school, however, as the effects began to wane around week 2. This is not uncommon – obviously due to most manufacturers using the same ingredients. Users felt tolerance build quickly and higher doses beyond that recommended were required to experience any results. As we all know, you should never increase the dose beyond what is recommended as this could lead to negative side effects. There are no majorly adverse side effects tied to OptiMind, but please keep in mind that the formula does include caffeine. If you are sensitive to caffeine, then you may experience heart palpitations and jitters. This can be avoided by staying hydrated and drinking plenty of water. Or avoiding caffeine altogether of course. Our readers have written in only a few times about OptiMind, so we wouldn’t consider it a very mainstream product yet. From the comments we have received, overall impression of the product range from unsatisfied to somewhat pleased. 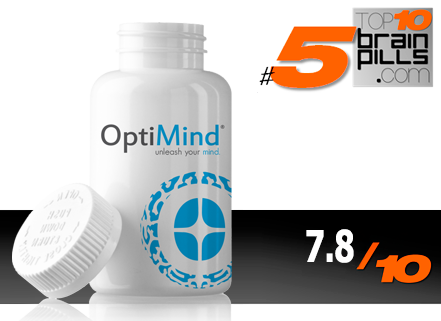 Altogether, OptiMind’s formula is good but not excellent. It’s certainly nothing new and you may have already (unsuccessfully) tested a different product, but with a very similar formula. Results did shine through for a short period of time but they quickly faded as tolerance was built. If you’re looking for a product that can give short bursts of productivity, then OptiMind may be a good option. However, for those looking for a more complete package, try checking out our Editors’ Top Choices.